I've been really busy this late summer/fall with my job and Max going through the Terrible Twos. I've blogged a bit for ShopRite and I have been cooking, but I haven't taken the time to photograph and write up many recipes. On a suprising and somewhat random note, I've recently learned to crochet and I'm really into it at the moment. I made so many items that I opened an Etsy shop. It's called KeeleyStudio. I'm considering doing some craft-related posts on this blog, so if there are any fellow crafters out there (who are also food enthusiasts) let me know! I'm excited about the fall/winter food celebrations. We're hosting Thanksgiving again this year and I'm also hosting a cookie exchange for the second time in early December. I'm sure those will be blog-worthy occasions. Wild Veggie sent me samples of a few of their products. I received complementary samples of their Butternut Squash Puree, Carrot Puree and Blueberry Breakfast Bowl. The Butternut Squash Puree makes a great shortcut for my butternut squash soup or can even be served straight up as baby food. The Carrot Puree shaves a lot of prep time off my carrot bread and carrot souflee. Those two products are absolutely worth the time saved in food preparation. Max and I tried the Blueberry Breakfast Bowl on a recent Saturday morning. Max loves blueberries and he enjoys oatmeal, too, so I figured this would be a hit. The breakfast bowl is a blend of steel cut oats and quinoa and is topped with whole blueberries. I was skeptical about the bowl having a fresh blueberry taste, but it did! This was the first time I’ve ever successfully got Max to eat quinoa. It really helped that it was blended with steel cut oats (a family favorite). The bowls are not overly sweet. As a matter of fact, you may decide to add a little bit of brown sugar, depending on your personal taste. We stored the bowl in the freezer and then cooked it in the microwave. It was a quick, healthy breakfast that pleased both my toddler and me. Max was very excited and kept yelling, “berries!” I think that means he liked it. I think these are a great healthy weekday breakfast (or snack) for busy adults who want to eat something healthier than a fast food sandwich or sugary cereal. It’s a nice change from my typical healthy breakfast of Greek yogurt. You can find Wild Veggie products in the freezer section of many grocery retailers. If you try them out, let me know what you think! I was given complementary samples of three Wild Veggie Products. The opinions expressed in this review are entirely my own. So I blinked and eight weeks flew by. Eight weeks without a blog post. There's been plenty of cooking, but not a lot of documenting. Plenty of Instagramming and a little Facebooking, but no blog posts. Sorry about that! It's summertime, my little guy is turning two this week (how did that happen?!?) and believe it or not, we're still unpacking boxes on weekends (we moved over a year ago). 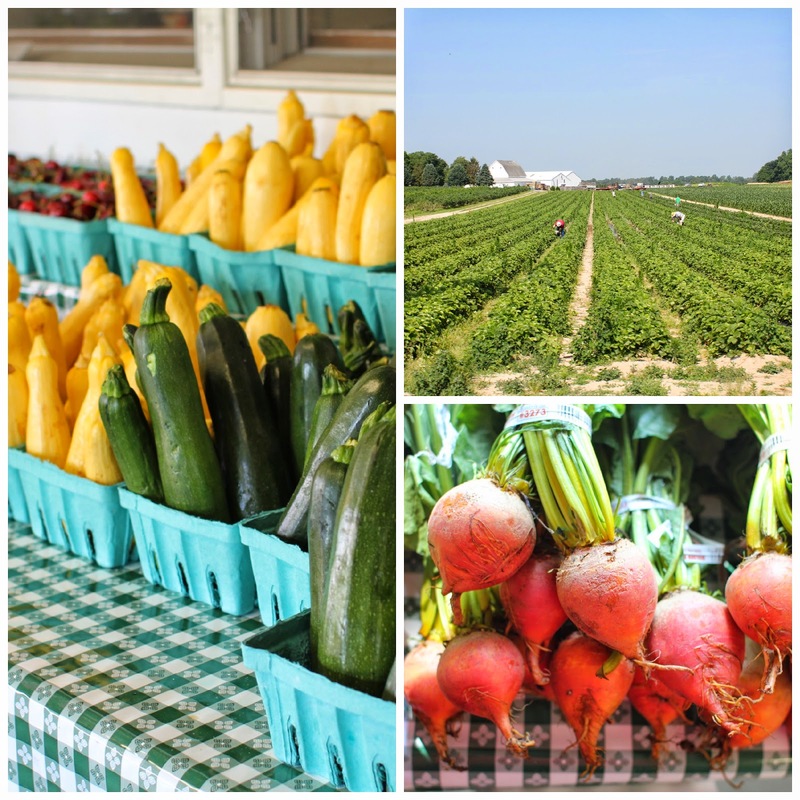 A few weeks ago I went on a farm tour with my local ShopRite store and my friend Iris from The Palate Princess. Despite the 90+ degree weather, I had a fabulous time. Check out my post over on ShopRite's Potluck blog and I'll be back soon with a recipe! This dessert is the result of a Mother's Day culinary mishap. I had a plan. I was going to bake a triple-layer cake filled with fluffy cream and fresh raspberries. And then, for unknown reasons, my cake fell. It was too ugly to fill with anything, so I had to come up with a Plan B. So I diced up the cake, adjusted the cream filling and made parfaits! I ended up making four large parfaits, but you could easily make six regular-sized ones or eight small ones. The cake and cream are light and fluffy with a refreshing lemon flavor and the sweet raspberries were perfect. Of course, you can use another berry if that's your preference. I made my cake from scratch, but if that's not your thing please feel free to purchase one from the store. It's warm outside... no need to overdo it with the oven in the kitchen! 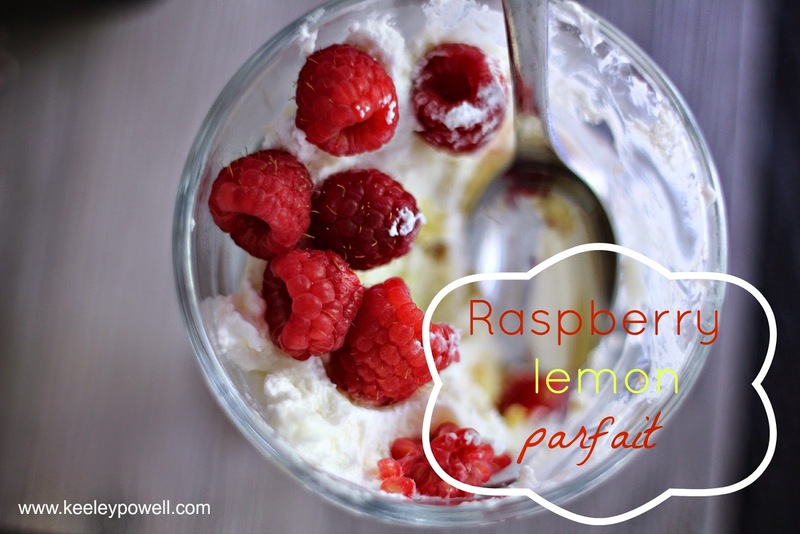 This is a quick and easy dessert for your Memorial Day celebrations! Enjoy! With an electric mixer, mix together cream cheese, lemon extract and powdered sugar until blended. Gently fold in whipped cream. Set aside. Place a few pieces of cake on the bottom of each dish/cup. Put whipped cream over the cake and then top with berries. Repeat with each dish/cup until all are full. Cover each dish with plastic wrap and place in the refrigerator for at least 30 minutes before serving. 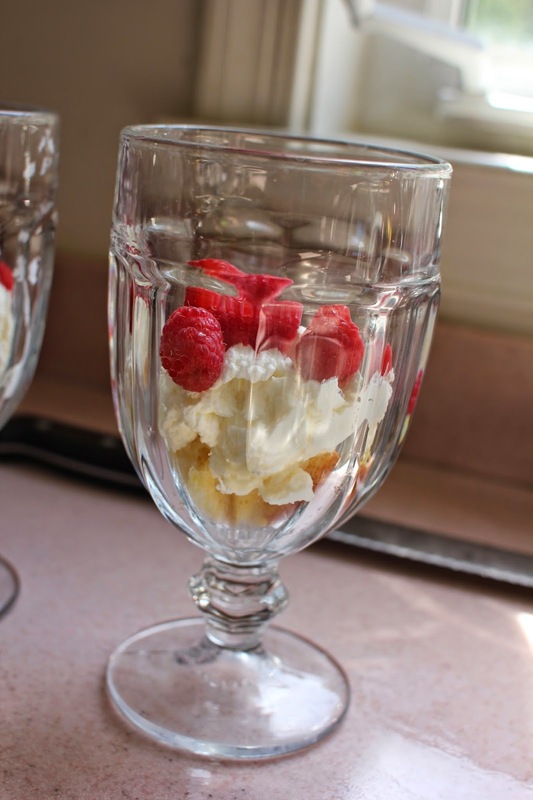 You can make these parfaits about 6 hours before serving, but try to consume them within 24 hours or the whipped cream will deflate. A few weeks ago I had the pleasure of spending 8 days in San Diego. I was traveling for work and I didn't have much free time. I did, however, make time (and room in my personal budget on my only free morning) for a very special brunch at the famous Hotel del Coronado. This was my first trip to California and a few people back home told me that this brunch was the best they've ever had and worth the $85 (gulp!) price tag. Yes, nearly $100 for brunch. But, how many times am I going to be in San Diego with a free schedule on a Sunday morning? I have no idea. So I just splurged and went. It was so worth it. Hotel del Coronado is located on Coronado Island which is separated from downtown San Diego by a bridge that's a couple of miles long. The hotel is famous, over a century old and some people say it's haunted. I'll assure you that it's beautiful and not creepy at all. 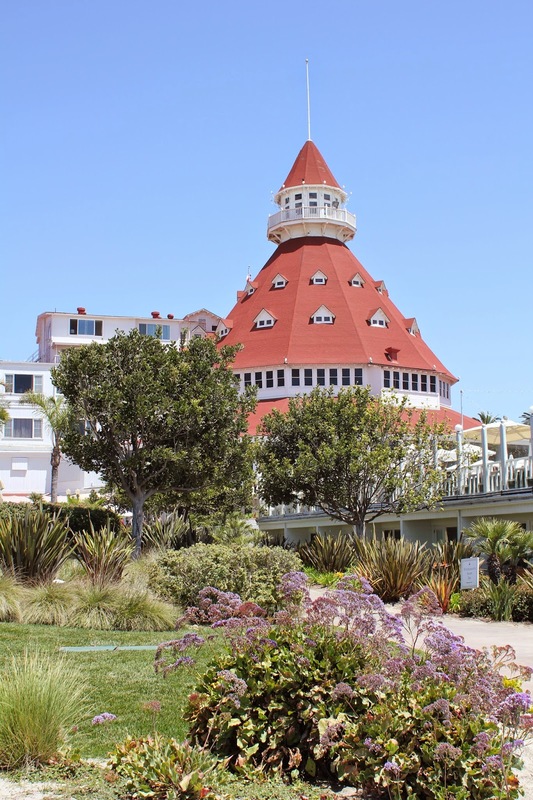 The entire town of Coronado is well worth the visit if you're ever in San Diego. I visited Hotel del Coronado early in my trip, so it was here that I got my first view of the Pacific Ocean (at least from the ground). Yes, it was amazing. Unlike the Atlantic Ocean, here I saw cacti and succulents growing in the dry sand on the beach. I'm pretty sure we don't have anything like that on the east coast. I was also amazed that you can see mountains within sight of the beach. If you visit Coronado, the beach is right there. But let's talk about the food. The selection was amazing and I thoroughly enjoyed 90% of what I tasted. There was a huge seafood section, a cheese bar (warm brie, dried fruits, nuts! ), a bit of Mexican cuisine, plenty of fresh fruits, all types of vegetables, every salad imaginable (with and without meat and/or seafood), a massive carving station, beautiful desserts, bottomless mimosas and bloody Marys, and every traditional breakfast food you'd expect (waffles, french toast, pancakes, an omelet station). The service was fantastic, as well. My glasses were always full, my table was always clean and cleared of crumbs and I never had to wait for any food to be replenished. This brunch was an awesome splurge and I'll remember it for years to come. What impressed me the most is that while the food is mass produced (it is a buffet, after all), each dish tastes like it was prepared with care in a small batch by an expert chef... because I'm sure it was! I also appreciate the presentation of the food on the buffet. You feel like you're serving yourself at an intimate dinner party instead of a huge buffet. I am so happy that I decided to enjoy this memorable brunch experience. I think this meal would be a great choice for a special celebration like a milestone birthday or anniversary. Plus I got some great ideas for my own meals at home. I'm hoping to attempt Grand Marnier French Toast sometime in the near future. Are you into brunch? Have you splurged on a special meal lately? After a long, cold winter with tons of ice and snow (you should see the condition of our driveway... it's a cracked mess!) I am so excited that the flowers are finally blooming, the grass is green and Easter is this weekend! I'm hosting a small Easter dinner this year and I'm very excited. One of the best things about moving to a larger home with a formal dining room has been sharing our space with friends and family for special meals, parties and holidays. It really makes the hassle of moving worth it. I'm in the process of finalizing our Easter dinner menu. I've created a board on Pinterest with my menu and tablescape ideas, so please check it out and let me know what you think. My plan is to make a traditional meal, but to make sure that it's distinct from the heavier foods that we typically serve during the cold weather holidays (Thanksgiving and Christmas). Sweet and savory roasted sweet potatoes are a lighter and healthier way to bring sweet potatoes to your holiday dinner table. I love to enjoy these in the spring and summer with barbecue. Asparagus is in season and roasted asparagus is always a spring favorite around here. Of course in addition to turkey and roasted pork loin, we'll also have macaroni and cheese, Southern-style cornbread dressing, and some indulgent desserts, too. Do you have any special plans for the Easter holiday? Have you hosted a family holiday meal? I'm new to this, but Thanksgiving was a hit last year, so I'm looking forward to many more!